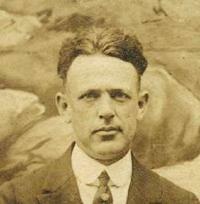 Joseph Francis Phelan married Helen Marie Dwyer, daughter of John Dwyer and Anna Dawson, on 11 September 1913 at St. Francis Church, Waterbury, Connecticut. They were married by the Reverend Father Curtin who celebrated the nuptial mass. The attending couple were George Phelan, a brother of the groom, and Miss Anna Dwyer, a sister of the bride. As both were well known in that section of the city, the church was crowded with friends and relatives. They left on a trip to Washington and other places of interest.3,11,24,25,26,5,27,28,29,30,31,32 Joseph Francis Phelan was an informant to the death of John Joseph Phelan, his son, on on 8 September 1914 at 23 South Street, Waterbury, Connecticut; from exhaustion due to nephritic and marasmus. Thomas E. Parker, M.D. [S45] Joseph Francis Phelan entry, Birth Certificate (7 April 1892). [S283] John J. Phelan household, 1900 United States Federal Census, New Haven, Connecticut, population schedule, waterbury, ED 432, sheet 25, dwelling 263, family 468. [S49] Joseph Phelan's Death Certificate. [S68] The Waterbury Republican-American, February 6, 1919, shows survivors. [S730] The Waterbury Democrat, February 5, 1919, Page 7, shows survivors. [S283] John J. Phelan household, 1900 United States Federal Census, New Haven, Connecticut, population schedule, Waterbury, ED 432, sheet 25, dwelling 263, family 468, shows age 8. [S285] Joseph Phelan household, 1920 United States Federal Census, New Haven, Connecticut, population schedule, Waterbury, ED 464, sheet 6A, dwelling 41, family 110, shows age 28 and birthplace as Connecticut. [S1532] Ralph Phelan entry, Birth Certificate, shows the father's age as 33 and birth place as Waterbury, Conn. (Received for record on the 17 October 1924). [S286] Joseph F. Phelan household, 1930 United States Federal Census, New Haven, Connecticut, population schedule, Waterbury, ED 5-250, sheet 6B, dwelling 47, family 123, says age 37. [S1281] Joseph F. household, 1940 United States Federal Census, New Haven, Connecticut, population schedule, Waterbury, ED 5-24, sheet 1A, number of household , 9, shows Joe as age 47 and birthplace as Connecticut. [S162] "WWII Draft Registration Cards, 1942", Joseph Francis Phelan, 1942; shows April 6th instead of 7th. [S673] The Waterbury Republican-American, 12 September 1913, shows the groom's residence. [S60] Waterbury Connecticut Street Directory, Joseph F. Phelan, 1913; shows residence as 332 Baldwin Street. [S1563] John Joseph Phelan, Death Registration. [S10] John Phelan's Death Certificate. [S1380] "Connecticut Military Census of 1917", Joseph Francis Phelan. [S40] William Phelan's Death Certificate. [S41] Dennis Phelan's Death Certificate, Volume 39. [S158] Phone conversation, Ada Fehrs, 11 June, 2007. [S60] Waterbury Connecticut Street Directory, Joseph F. Phelan, 1946; Section P, Page 752. [S51] Loretta Phelan's Death Certificate. [S60] Waterbury Connecticut Street Directory, Joseph F. Phelan, 1957; Section P, Page 544. [S746] John Joseph Phelan's Certificate of Baptism: shows father, 24 June 1914, Saint Francis Xavier Church. [S1563] John Joseph Phelan, Death Registration, shows father as Joseph Phelan. [S10] John Phelan's Death Certificate, shows father as John Dwyer.